Radio Frequency Systems (RFS), the global wireless and broadcast infrastructure specialist, announced that it has introduced a new addition to the CompactLine® series of microwave antennas with the release of the 6 GHz Category A SB6-W60B. Featuring a wind-tunnel tested design suited for both tight urban locations and rugged outposts, the SB6-W60B offers a superior radiation pattern for consistent performance with less interference. The VITA 67.0, 67.1 and 67.2 standards, which define the RF connector modules for implementation within the OpenVPX™ architecture, have been ratified by the American National Standards Institute (ANSI). TE Connectivity's (TE) RF connector modules, which meet these new standards, have been designed for high-reliability, high-density aerospace and defense applications that meet the vibration, environmental and corrosion resistance requirements of VITA 47. Carlisle Companies Inc. announced the signing of a definitive agreement to acquire the Thermax–Raydex business, a leading global supplier of high-performance hook-up, data and coaxial wire and cable for mission-critical applications for commercial aerospace, defense and industrial customers. API Technologies Corp., a trusted provider of RF/microwave, microelectronics, and security solutions for critical and high-reliability applications, announced the new SST™ Secure Communications Hub (SCH) with integrated encryption. The SB1500ER Secure Communication Hub is a single, integrated device that replaces case-based solutions. It provides both 3G or satellite connectivity and high grade (Type 1 equivalent) IP encryption. The SCH is currently deployed in the UK Government. AR Modular RF has received a large order from the U.S. Navy for its KMW1031KT 20-watt, 30-512 MHz booster amplifier kit. Cassidian has developed a new generation of transmit and receive modules which give the new Active Electronically Scanned Array (AESA) radars previously unattained performance, the company claims. The Lockheed Martin team developing the U.S. Air Force’s next generation Global Positioning System III satellites has completed thermal vacuum testing for the Navigation Payload Element (NPE) of the GPS III Non-Flight Satellite Testbed (GNST). Raytheon Co. has achieved two significant milestones on the Cobra Judy Replacement program, meeting critical performance requirements to advance ongoing system integration. 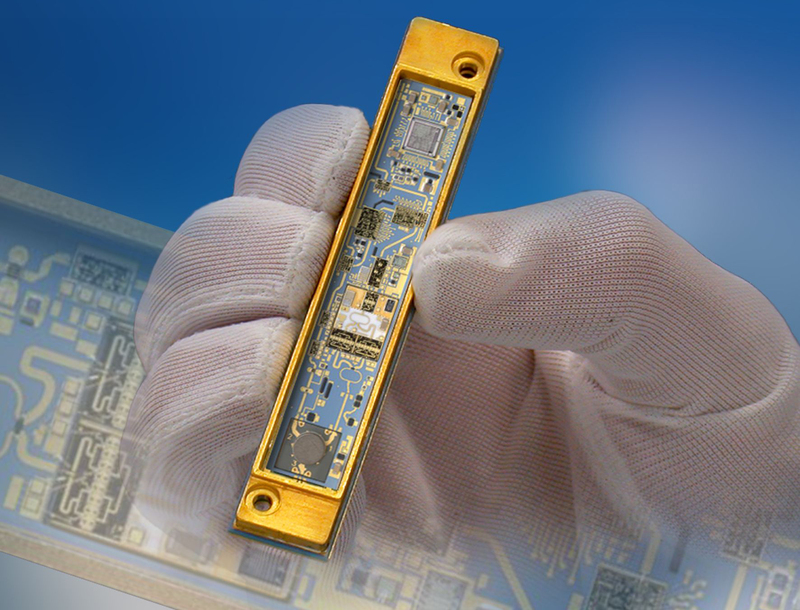 Crane Aerospace & Electronics Microwave Solutions introduces a newly developed surface-mount image rejection mixer designed for space-flight applications.